Julia Turshen is a cook, a writer, a panelist, an interviewer, a wife, a dog lover, a food activist. But I didn’t know all of this at first; to me, she was the developer of my favourite recipes. Yes Julia Turshen has been in my kitchen for a long time. I’ve cooked from her books -she has collaborated on many, from Gwyenth’s Paltrow’s My Father’s Daughter and It’s All Good, to Jody Williams’ Buvette, and of course her own book Small Victories, which came out last year. Her writing style is so friendly, clear and accessible. What does accessible mean? It means this woman can work with the stars but still communicate with the average home cook. Easily. That’s what I love about her. 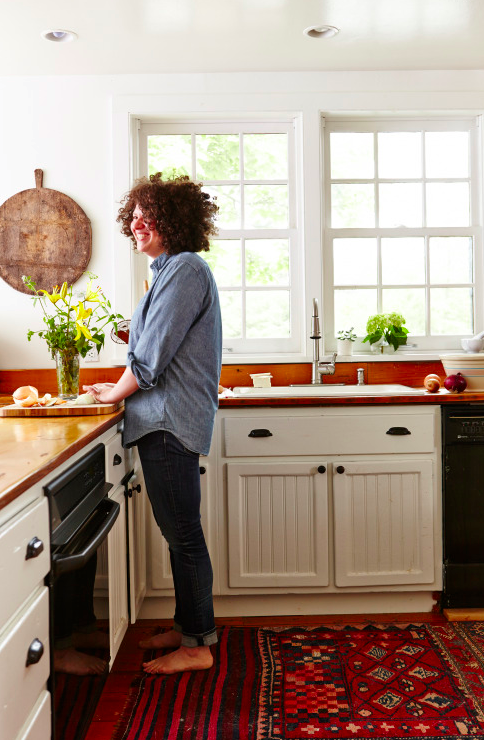 And every time we home cooks rock it in the kitchen, Julia encourages us to celebrate it. A Small Victory! As the original host of the Cherry Bombe podcast, her voice also filled my kitchen. Every episode she’d interview fascinating women in the world of food from the back of Roberta’s Pizza in Brooklyn. Listening to her, that’s when her layers were really revealed. Yes, she can guide a home cook – from new to advanced – through a recipe. But she’s also a journalist with a smart, curious mind. Her questions were thoughtful. She was confident but humble. She inspired me to read a little closer, to ask better questions, to be a better journalist. So I asked her for an interview. (You can read all about that story – Girl Crushes– here). That was back in May. We talked about food, people, life, recipe writing, but most of all, we talked about Food Activism. I didn’t realize it at the time, but she had another book in the works – Feed The Resistance – coming out next month. Another layer! She and her wife Grace volunteer as cooks at a community kitchen. In doing so they feed those in need. They’ve made friends in their community. They fight injustice, one meal at a time. That’s what Food Activism is. It’s coming together, through food. Julia Turshen is encouraging us all to come together through food. And this is really what this interview is about, featuring her humble but strong voice. Nourishing one another is the biggest small victory I can think of.